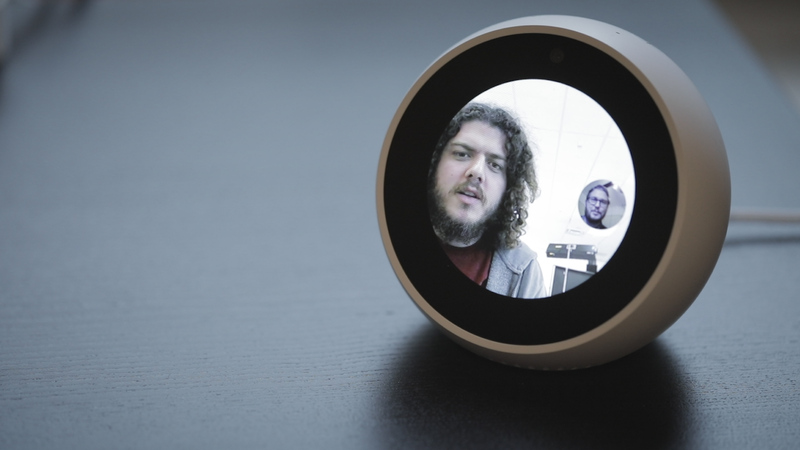 I got excited when the Echo Spot debuted. At the time, I tentatively declared it the best Echo at the time, and after living with the device for the better part of a week, my sentiments haven’t really changed. 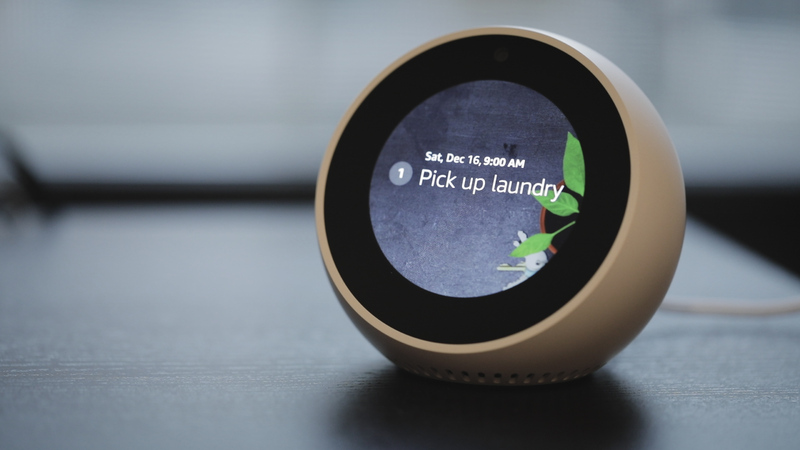 While rumors about a touchscreen Google Home have been floating around for a bit, the Echo line is still the only major player in the space with the functionality — making Amazon its own biggest competitor. And honestly, I wouldn’t be surprised if the Spot starts eating into Show sales in a big way. A few case uses aside, there really aren’t that many reasons to plunk down the extra $100 for the Show. 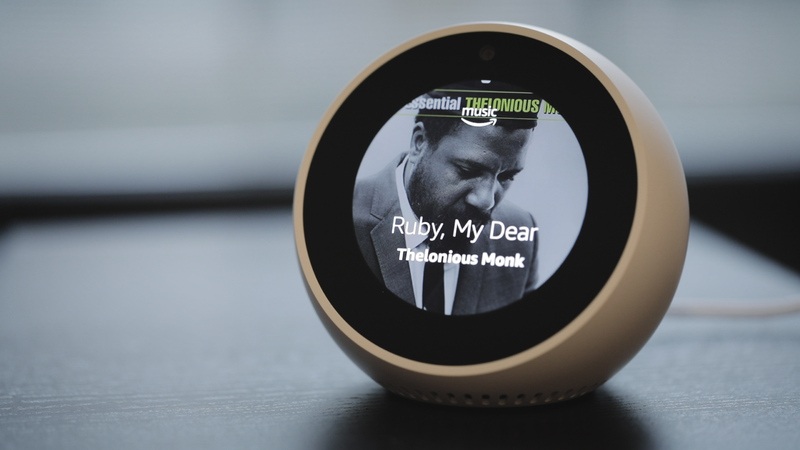 The biggest change in this most recent round of Echo devices is the fact that Amazon’s actually started to give a crap about design. The Echos were kind of crummy and plasticky looking, betraying a company that was more interested in getting its platforms into the home, rather than actually blending in with them. The Echo got a nice design makeover, with fabric covers and the like, and likewise, the Spot is a much better looking device than the Show. The first Echo was big and plasticky and clunky, with all sorts of weird, brutalist angles. The Spot’s a small, half-circle, available in either white or black. The company likely could sell even more if it offered them in a wider variety of colors, but between the two current options, it should fit pretty well into most settings. It’s not bleeding-edge design, but it’s minimal without being boring and is honestly pretty nice looking, so far as alarm clocks go. An Amazon rep tells me the circular design wasn’t chosen for any particular practical purpose — it was a purely aesthetic decision. There is, however, one big downside to all of that: it really messes with video playback. It’s pretty clear that Amazon didn’t expect too many people to actually watch video on the thing. The screen is 2.5 inches, to the Show’s seven. When you attempt to watch a video, a big portion of the screen is taken over by big, black letter boxing, adding the already sizable bezel. When the video pops up, there’s an option for zooming in. That will eliminate the letter boxing problem, but you’re going to lose everything on the periphery. It’s a weird sensation — a bit like watching something through a porthole. Of course, on top of the size and dimensional constraints is the fact that the screen has a 480 x 480 resolution. 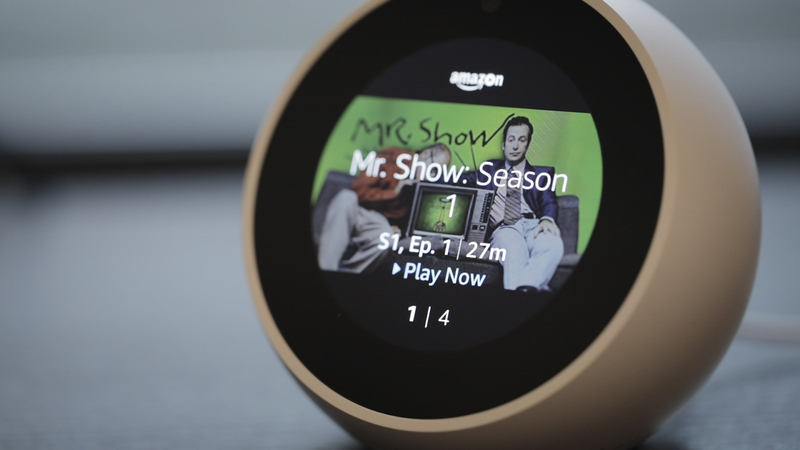 That means it’s not great for much beyond playing short videos — and, unfortunately, bickering between Amazon and Google means when you ask Alexa to “play YouTube,” she answers, curtly that “web videos are not supported on this device.” Amazon video does have some short form content, but it’s no YouTube. Because nothing is YouTube, except for YouTube. Similarly, the speakers, which were a key focus on the new Echo and Echo Plus, are nothing to speak of, or hear. The get surprisingly loud, but like the Dot, you’re not going to want to use them for much more than communicating with Alexa. For music playback and the like, there’s an audio out port on the back, Bluetooth playing and multi-room music streaming — in other words, you have plenty of much better options for listening to music through Alexa. 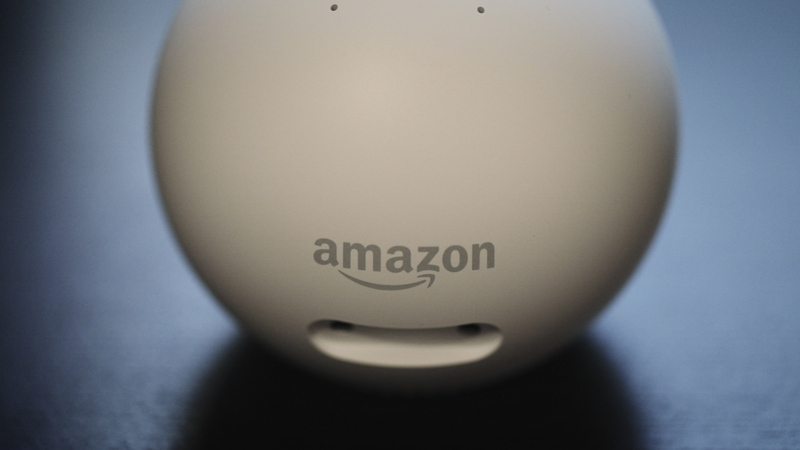 Amazon designs these device around where they’re intended to be used in the home. And yes, the closest non-smart analog for the Spot is the alarm clock. I had it next to my bed for most of my time with the device. 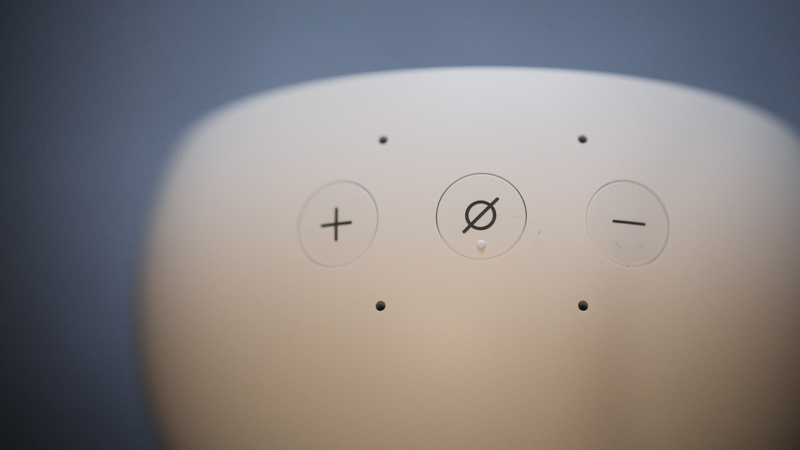 It’s a good size and shape for a nightstand, and mornings are really the most useful time of day for an Echo — it’s when you’re looking for useful bits of info like the weather, traffic and news — the latter of which the Spot delivers as flash briefings. Those are short little news videos from top video providers. Pick, say, TechCrunch, to choose a totally arbitrary example, and it will play Crunch Report. 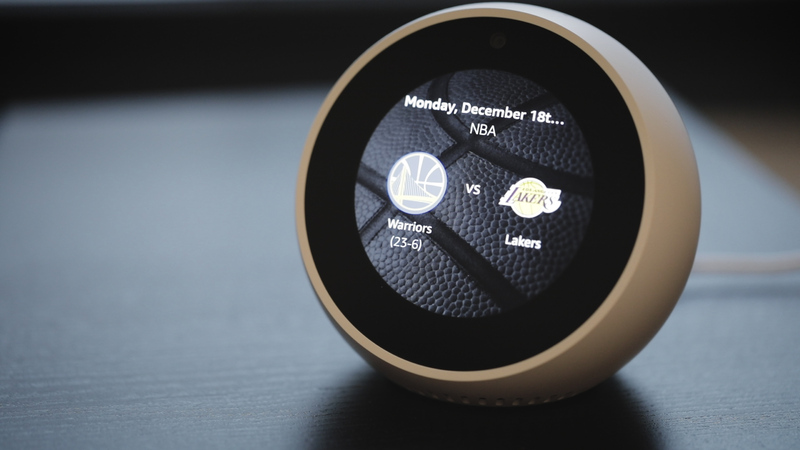 About a week or so back, Amazon brought alarm clock functionality to the Echo line — the timing was a surefire sign that the Spot was just over the horizon. Ask Alexa to, say, “Wake me up to Thin Lizzy at 6:00AM tomorrow,” and the device will do just that, pulling songs from Amazon Prime. You also can ask it to wake you to radio stations through Tune-In. Handy feature that. Of course, releasing a device designed to live by the side of your bed really stirs up all of those smart speaker privacy issues we’ve been talking about for a few weeks. As ever, the Echo is always listening, and while the company has added security precautions to ease users’ minds, things get even more tricky when you add a camera into the picture. As with the rest of the Echo line, there’s a button on top that turns off the microphone, lighting up a red circle around the display to let you know that it’s no longer listening. There’s no voice command to turn the mic off (likely because you then wouldn’t be able to turn it back on with a similar command), but turning off the video camera is accomplished by voice. Strangely, there’s no equivalent to the red ring here. Alexa just cheerfully lets you know that the camera’s off and she’ll turn it back on tomorrow. Amazon should make this functionality more straightforward in future versions. The company should also consider selling a camera-free model. Honestly, aside from video calling, there aren’t a ton of applications for the feature, so many users likely wouldn’t even miss it. One of the nicest things about the Echo line is the speed with which the company is adding new skills. As of December 2017, Alexa’s ecosystem is a fairly robust one. Though, these screen models are relatively new additions, so the selection of visual tools is still a bit lacking at the moment. With most of the more basic skills, like weather and traffic, the company’s done a decent job creating static images. That said, there are still some solid skills that make good use of the screen, like the aforementioned video calling. The most compelling, however, is probably smart home camera and baby monitor functionality. The device is compatible with a wide range of devices from big names, like Arlo, August, Nest and Ring. It’s handy having a little screen nearby for checking in when someone’s at the door. I like the Spot. If I was current in the market for an Echo device, this would probably be the one. It’s one of the better looking members in the line and the $129 price seems just about right. The display’s usefulness is hampered somewhat by size and a relative lack of skills that really take advantage of the tech, but it does bring some nice functionality to the table. As with all of these devices, I recommend that anyone who’s in the market does a cost benefit analysis of the useful features versus privacy concerns. All of that is compounded when you stick the product in a bedroom and add a camera. Amazon’s got ways of disabling all of that, but I’m strongly considering becoming one of those blue electric tape people and covering the thing up most of the time — there just aren’t that many applications for a built-in camera. If none of this seems particularly concerning to you, however, the Spot quickly shoots up the list of available Echos. It’s a nice addition to the line, and Amazon’s about to sell a whole lot of these.